Today, the Cheshire Bridge Road corridor is known for being, well, diverse. It’s a mix of decades-old businesses and, in more recent years, adult entertainment venues. But tucked away, behind all the development, there is actually a creek running through the area. And now there’s also a trail to explore it. The Cheshire Farm Trail, which opened earlier this fall, is just off Cheshire Bridge Road, before the street heads under I-85 and turns into Lenox Road. 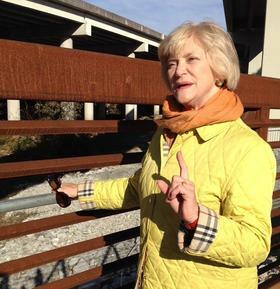 City Cafe visited the new green space recently with Sally Sears of the South Fork Conservancy and discussed the area’s early beginnings and its future.